H∞ is a model-based, output-feedback control. First a plant model must be available, either from physics or experiments. The latter, often referred to as system identification (Sys-ID) process, is prefered for control design, since it generally gives a good model that represents the real plant. For best result, the acquired model must be validated using different datasets from the ones you use in the Sys-ID. Control synthesis is no different from any other computer algorithm: garbage-in, garbage-out applies. So the first and important step in the process is to put valid problem data to a form that the algorithm can interpret. This setup is sometimes called a “modern” paradigm, even though it’s quite dated already. 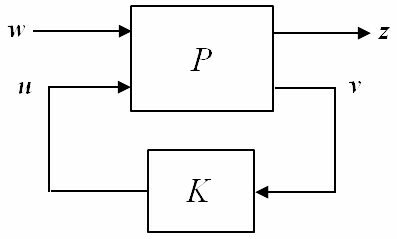 Whatever the name, the framework is shown in Figure 1, consisting of the generalized plant P connected with the stabilizing controller K. Data in P contains the plant together with all weighting functions, while K is the controller we want to synthesize. Port w and u are exogenous input and control variable, and z and v are exogenous output to be minimized, and measured output to the controller, respectively. In a feedback diagram the signal v and u normally corresponds to the input and output of the controller. On the other hand, the signal w and z are defined according to the problem at hand. As an example, consider the feedback system in Figure 2 with signals at certain points labeled as r =command, d = disturbance, n = measurement noise, e = tracking error, yp = plant output, u and v are controller input and output. It is straightforward to arrange the diagram to the framework shown in Figure 3. Typically it’s not necessary to include all the signals shown here. For a regulation problem, say, the command signal r should be neglected. With this setup, a generalized plant can be formed as shown in Figure 4, in transfer function (left) and state space (right) structures. This setup is also called S/T mixed-sensitivity problem. Figure 5 shows how to form a generalized plant. For performance requirement, the minimization of ||w1|| ∞ < 1 is equivalent to S(jω)| < 1/|w_1(j\omega)|, ∀ω. In words, we want the sensitivity gain |S| to lie below the inverse of weighting function w1 for all frequency. Roughly speaking, we simply plot gain of 1/w1 and see if it looks like the desired sensitivity gain. The three quantities of interest, shown in Figure 6, are A=minimum steady-state tracking error, ωB=minimum bandwidth (where 1/|w1| crosses 0.707), and M= maximum peak magnitude of S.
A weighting function w2 to constrain bandwidth can be chosen such that the gain of 1/w2 forces a rolloff at desired frequency. The next article in this series will provide an example of servo robot joint control using Scilab/Xcos. Stay tuned.